Over lunch this week, we sat side by side. In between bites of pork loin and vegetables, we chatted, our conversation never faltering. It was like a tennis game, each of us taking our turn talking and listening. It is the way of women. As I meditate upon Mary’s visit to Elizabeth her relative, so many questions circle in my mind. I want more details. What is left untold is left to the imagination. Mary hurried to the town in the hill country of Judea? What was her hurry? I have my thoughts. 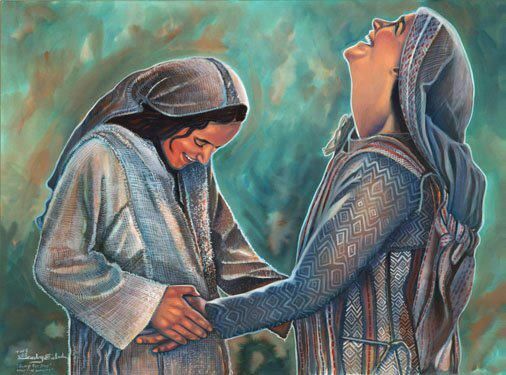 People didn’t believe her story of an angel’s visitation, of the Holy Spirit coming upon her, of a pregnancy before she and Joseph were husband and wife. But perhaps Elizabeth would. She was the recipient of her own miracle. The long journey on foot would have been weary for young Mary. Perhaps she sighed with relief when the house finally came into view. Longing for some refreshment and a place to rest, she knocked on the door. Elizabeth greeted her and then the joy happened all around them. The presence of the Holy Spirit surrounded the young and the aged and the babes in their wombs. The atmosphere was electric, and their faith in a God who works wonders united in explosive praise. When we believe, we are blessed. When we believe, we honor the God who promised. When we believe, we encourage one another. When we believe, the Holy Spirit is powerful in us. What are you believing for this day? Does it seem impossible? Have you been waiting long? Sometimes we need to gather together and believe with each other. Let faith arise. Let God be exalted Encourage one another with words of confidence and trust in a Mighty Savior.